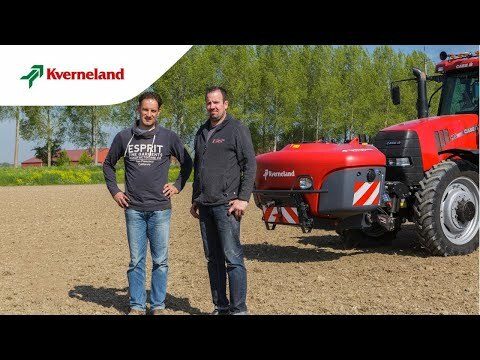 The iXtra LiFe together with the Kverneland Optima precision seeder ensures that seeds are sown at the right place and applies the correct amount of liquid fertiliser at the same time. For the best start of the crop, the liquid fertiliser is placed close to the seed. The smart electronics on both seeder and front tank communicate so the application starts and stops together with each individual row. The iXtra LiFe provides liquid fertiliser close to the rows of the precision seeder. With the stricter fertilisation legislation an efficient nutrient application is key to reduce the total amount of fertiliser every year. Row fertilisation is a way to increase efficiency and save money due to a better placement of the fertiliser near the seeds. With a 1300 litre maximum tank volume of liquid fertiliser (nominal volume of 1100 litre) the front tank is well balanced and gives an equal weight distribution with 2 x 65 litre rinsing water. Easy to hitch and park: hydraulic driven pump (no PTO shaft needed), plug & play ISOBUS cable and parking wheels for quick connection. ISOBUS electronics: up to 18 individual sections combined with electric driven seeding rows on the seed drills and planters ensure exact row switching without overlap on both seeds and fertiliser. IsoMatch GEOCONTROL with GPS control row by row automatically for optimal driver comfort. For more information, click on the "Control system" tab. Complete sprayer functionality „without boom“. Meaning; including own electronics, pressure regulator, section valves and cleaning system. An electrical level indicator provides actual tank volume to a spraying computer as well as via the external display on the valve panel. The iXtra LiFe front tank stands for precision farming. The electronics, ISOBUS, ensures there is no overlap by operating with section control for seed and fertiliser. Row fertilisation is a way to increase efficiency and save money due to a better placement of the fertiliser near the seeds. Because of the increased efficiency lower rates can be used, creating space in tight fertilisation plans for additional use of organic fertilisers. This contributes to increase soil organic matter content and improve soil fertility. The iXtra LiFe nozzles follow the status of the ISOBUS planter when switching on or off sections and regulates the application rates based on driving speed. The iXtra LiFe can also work standalone, for example in combination with inner row cultivators or mechanical weeding. IsoMatch GEOCONTROL manages your dosing rates and section status for both the liquid application and the planters seed rows automatically, so the driver can focus on the seeding process. For more information, click on "Control system". iXclean prevents that unintended residual enters the environment and ensures a clean working space. The iXtra LiFe has an integrated agitation and cleaning system as standard: ENFO Inside. This smart technology optimises filling and cleaning of the spray lines, even when the tank is still filled. This is an accurate application, there is no waste of liquid and you are saving water. These are important benefits for you and your environment. The iXtra LiFe is 100% ISOBUS compatible as standard, which means easy plug and play with the IsoMatch Tellus GO or PRO or any other AEF certified terminal. 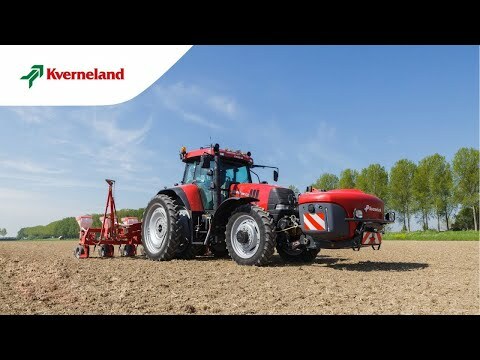 Up to 18 individual sections combined with electric driven seeding rows on the seed drills and planters ensure exact row switching without overlap on both seeds and fertiliser. IsoMatch GEOCONTROL with GPS automatically switch on or off in exactly the right place, ensuring that there is no overlap in the headland or in any row that has already been seeded. This is especially the case in triangular shaped fields and on curved or irregular shaped headlands. This means there is a reduced overlap with section control for both seeds and fertiliser. The IsoMatch Tellus PRO terminal has the capability to view and operate with 2 different ISOBUS interfaces at once. This allows to direct control of 2 implements at the same time, like to iXtra LiFe and the seeding machine, without switching between screens. You will always have a clear overview of your work.